Your profession calls for you to present your best at all times, so why wouldn’t you do the same online? Don’t be fooled by the name — Private Lawyer is an organized, sophisticated looking layout for any business website that will give you an edge over the competition. The stylishly simple layout is very intuitive to navigate and presents your content in a clean and clutter-free way, allowing your clients to find what they’re looking for without any headaches. Gone are the days when you had to setup every section of the site step-by-step in WordPress. With Private Lawyer theme, you simply activate the theme and — voila — you can start adding listings, description, images, widgets, testimonials, blog posts, and pages. Every element is set out of the box and easily editable if desired! 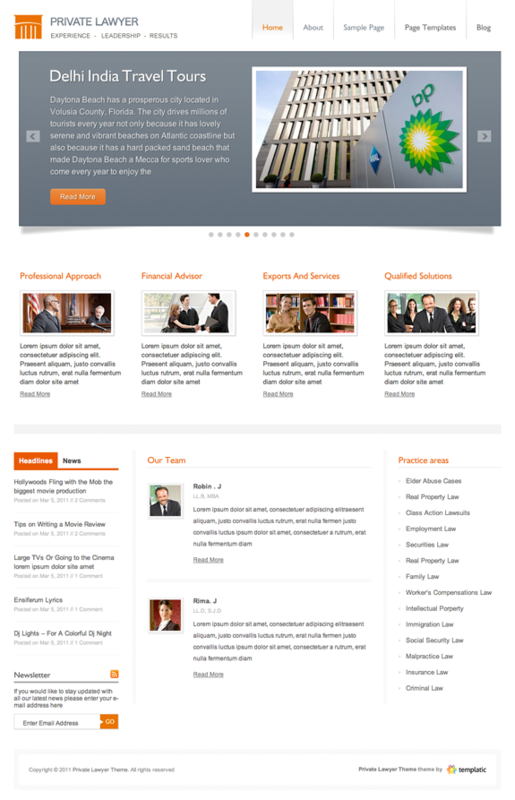 Private Lawyer’s homepage is customizable via dynamic widgets which are built specially for this theme. Designed strategically, the structure of the page is carried out in such a way that it gives maximum exposure to essential elements. There are plenty of design settings integrated in this theme — now you can control various elements of the theme through the design panel. Change the font color, link color, background color, and many other settings without even touching the code. The slider is integrated into the homepage and it can also be removed easily (it is simply a widget). The slider will help to bring special attention to more important content; plus, you can insert videos into the slider as well as images. Come back and check out the showcase as we find more sites from around the web using Private Lawyer.